PPVFD has automatic mutual aid agreements with Hood and Johnson Counties to receive and provide services. Pecan Plantation resides in both counties. All vehicles and volunteers are insured by Hood County via mutual aid agreement. Engine 82 and Brush CAFS 86 were purchased by and owned by owned Hood County. All other vehicles are owned by PPVFD. Why does the Fire Department and EMS service have so much equipment? Rescue 81 is an engine used for extrication and rescue purposes. It carries the “Jaws of Life” for cutting a trapped person out of a vehicle. Engine 82 is a pumper tanker provided to us by Hood County. It is the first truck out if there is a fire outside Pecan. 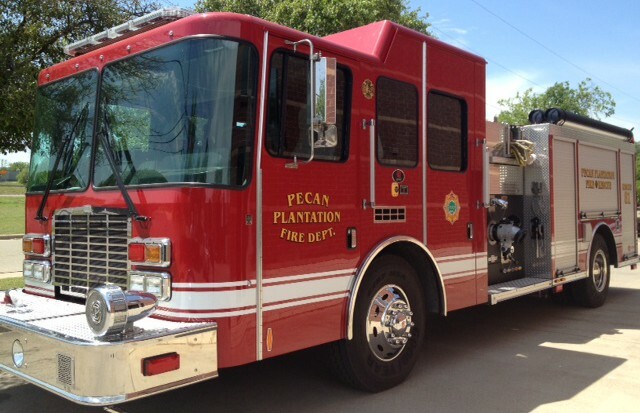 Engine 83 is the first truck out if there is a fire inside Pecan. 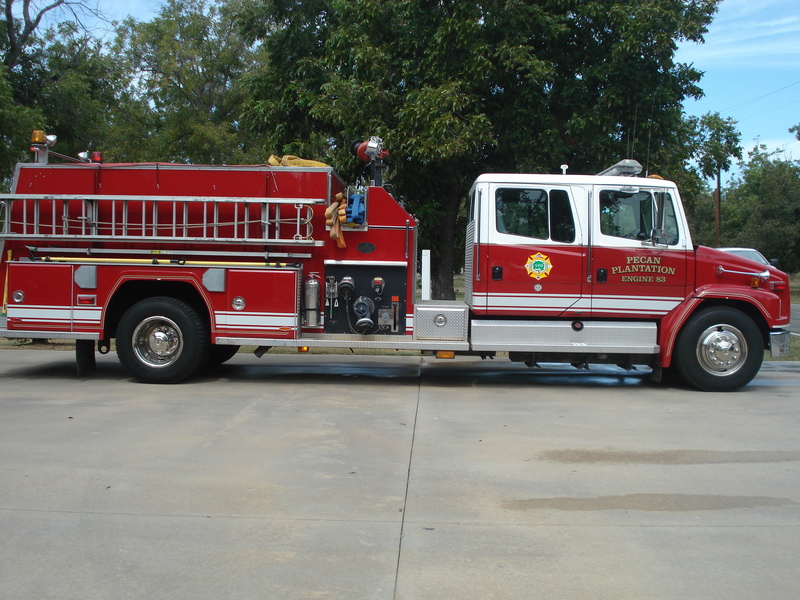 There are 3 brush trucks which are used in cases of grass fires and sometimes in rescue situations. Brush 86 has a CAFS system, which uses foam in extinguishing fuel fires and was provided to us by Hood County. Brush 84 was purchased on a grant from the Texas Forestry Service. Because of the types of equipment in our inventory, Pecan Plantation’s insurance rating is quite low (3), which in turn lowers our homeowners’ insurance premiums. We are very fortunate to have one of two Rehab trucks in the County. Rehab 89 contains supplies & hand tools for the Fire Crew, as well as water, ice, Gatorade and a few snacks for those fires that last for many hours. It looks like an ambulance, but on the inside, it’s been refitted to fit the needs of the firefighters. We also have two smaller, more agile vehicles, Squad 80, an SUV and Squad 81, a Dodge pickup truck. Squad 80 is a command vehicle. It can be on scene faster than the fire and brush trucks, even in wilderness terrain, which is necessary for setting up command and sizing up the situation. Squad 81, can also be used for a command unit, but it’s main function is a First Responder. It carries some fire equipment and medical equipment to be used until the ambulance arrives. It has an Automated External Defibrillator (AED), just like the ones at the PAC, Pecan Foods, tennis courts and Clubhouse. Mobile Intensive Care Unit used to respond to 911 calls or transfers. When one of our ambulances responds to a 911 call or a transfer, in most cases it is staffed by a paramedic and an EMT, making it an ALS or Advanced Life Support ambulance and one of the highest levels in the pre-hospital setting. An ALS ambulance enables the crew to treat the patient with many of the same medications and methodologies as a hospital ER or ICU, the main diagnostic tool we do not have on board is X-ray! With these three vehicles, we able to guarantee a quick response any time of the day or night. When in doubt, call us out! Call 911 for any emergency and please do not try to drive yourself or a patient to the EMS station. It is much safer and probably quicker if we come to you!